The internal market comprises an area without internal frontiers in which the free movement of goods, persons, services and capital must be ensured. To that end a Community type-approval system for motor vehicles is in place. The technical requirements for the type-approval of motor vehicles with regard to pedestrian protection should be harmonised to avoid the adoption of requirements that differ from one Member State to another and to ensure the proper functioning of the internal market. This Regulation is one of the separate regulatory acts in the context of the Community type-approval procedure under Directive 2007/46/EC of the European Parliament and of the Council of 5 September 2007 establishing a framework for the approval of motor vehicles and their trailers, and of systems, components and separate technical units intended for such vehicles (Framework Directive) (3). In order to achieve the aims set out in recital 1 of this Regulation, Annexes I, III, IV, VI and XI to Directive 2007/46/EC should be amended. Experience has shown that legislation concerning motor vehicles has often been of a highly detailed technical content. It is therefore appropriate to adopt a regulation instead of a directive in order to avoid discrepancies between transposing measures and an unnecessary level of legislation in the Member States, as there will be no need for transposition into national legislation. Therefore, Directive 2003/102/EC of the European Parliament and of the Council of 17 November 2003 relating to the protection of pedestrians and other vulnerable road users before and in the event of a collision with a motor vehicle (4) and Directive 2005/66/EC of the European Parliament and of the Council of 26 October 2005 relating to the use of frontal protection systems on motor vehicles (5) which provides requirements for the installation and use of frontal protection systems on vehicles and thus a level of protection for pedestrians, should be replaced by this Regulation in order to ensure consistency in this area. This implies that Member States repeal the transposing legislation of the repealed Directives. The requirements for the second phase of implementation of Directive 2003/102/EC have been shown not to be feasible. In this respect, Article 5 of that Directive requested the Commission to submit any proposals necessary to overcome the problems of feasibility of these requirements and possibly make use of active safety systems, whilst ensuring there was no reduction in the safety levels provided to the vulnerable road user. A study commissioned by the Commission shows that pedestrian protection can be significantly improved by a combination of passive and active measures which afford a higher level of protection than the previously existing provisions. In particular, the study shows that the active safety system ‘brake assist’, combined with changes to passive safety requirements, would significantly increase the level of pedestrian protection. Providing for the obligatory installation of brake assist systems in new motor vehicles is therefore appropriate. However, this should not replace, but rather complement, high-level passive safety systems. Vehicles equipped with collision avoidance systems may not have to fulfil certain requirements laid down in this Regulation to the extent that they will be able to avoid collisions with pedestrians rather than merely mitigate the effects of such collisions. After assessing whether such technology can effectively avoid collisions with pedestrians and other vulnerable road users, the Commission may present proposals amending this Regulation to allow for the use of collision avoidance systems. With the increasing number of heavier vehicles being used on urban roads, it is appropriate that provisions on pedestrian protection apply not only to vehicles of maximum mass not exceeding 2 500 kg, but also, after a limited transitional period, to vehicles of categories M1 and N1 exceeding that limit. In order to enhance the protection of pedestrians at the earliest possible stage, manufacturers who wish to apply for a type-approval in compliance with new requirements before they become mandatory should be able to do so under the condition that the necessary implementing measures are already in force. In particular, the Commission should be empowered to adopt technical provisions for the application of the test requirements and implementing measures based on the results of monitoring. Since those measures are of general scope and are designed to amend non-essential elements of this Regulation, inter alia, by supplementing it with new non-essential elements, they must be adopted in accordance with the regulatory procedure with scrutiny provided for in Article 5a of Decision 1999/468/EC. In order to ensure a smooth transition from the provisions of Directives 2003/102/EC and 2005/66/EC to this Regulation, the application of this Regulation should be deferred by a certain period after its entry into force. This Regulation lays down requirements for the construction and functioning of motor vehicles and frontal protection systems in order to reduce the number and severity of injuries to pedestrians and other vulnerable road users who are hit by the fronts of vehicles and in order to avoid such collisions. frontal protection systems fitted as original equipment to the vehicles referred to in points (a) and (b) or supplied as separate technical units intended for fitting to such vehicles. where the driver position ‘R-point’ is either forward of the front axle or longitudinally rearwards of the front axle transverse centreline by a maximum of 1 100 mm. ‘vehicles of category M1’ derived from N1’ means those vehicles of M1 category which, forward of the A-pillars, have the same general structure and shape as a pre-existing N1 category vehicle. 1. In accordance with Article 9, manufacturers shall ensure that vehicles placed on the market are equipped with a type-approved brake assist system in accordance with the requirements of Section 4 of Annex I and that such vehicles comply with the requirements of Sections 2 or 3 of Annex I. 2. In accordance with Article 10, manufacturers shall ensure that frontal protection systems either fitted as original equipment to vehicles placed on the market or supplied as separate technical units comply with the requirements of Sections 5 and 6 of Annex I. 3. Manufacturers shall provide to the approval authorities appropriate data on the specifications and test conditions of the vehicle and frontal protection system. The data shall include information required to check the functioning of any active safety devices installed in the vehicle. 4. In the case of frontal protection systems to be supplied as separate technical units, manufacturers shall provide to the approval authorities appropriate data about the systems specifications and test conditions. 5. Frontal protection systems, as separate technical units, shall not be distributed, offered for sale or sold unless accompanied by a list of vehicle types for which the frontal protection system is type-approved, as well as by clear assembly instructions. The assembly instructions shall contain specific installation prescriptions, including fixing modes for the vehicles for which the unit has been approved, to enable the approved components to be mounted on that vehicle in a manner that complies with the relevant provisions of Section 6 of Annex I. 6. The Commission shall adopt implementing measures laying down technical provisions for the application of the requirements set out in Annex I. Those measures, designed to amend non-essential elements of this Regulation, inter alia, by supplementing it, shall be adopted in accordance with the regulatory procedure with scrutiny referred to in Article 40(2) of Directive 2007/46/EC. 1. The manufacturer shall submit to the approval authority the information document, established in accordance with the model set out in Part 1 of Annex II, when applying for EC type-approval of a type of a vehicle with regard to pedestrian protection. The manufacturer shall submit to the technical service responsible for conducting the type-approval tests a vehicle which is representative of the vehicle type to be approved. 2. The manufacturer shall submit to the approval authority the information document, established in accordance with the model set out in Part 2 of Annex II, when applying for EC type-approval of a type of a vehicle with regard to it being fitted with a frontal protection system. The manufacturer shall submit to the technical service responsible for conducting the type-approval tests a vehicle which is representative of the vehicle type to be approved fitted with a frontal protection system. At the request of that technical service, the manufacturer shall also submit specific components or samples of materials used. 3. The manufacturer shall submit to the approval authority the information document, established in accordance with the model set out in Part 3 of Annex II, when applying for EC separate technical unit type-approval of a type of a frontal protection system. The manufacturer shall submit to the technical service responsible for conducting the type-approval tests one sample of the type of frontal protection system to be approved. Where that technical service considers it necessary, it may request further samples. The sample(s) shall be clearly and indelibly marked with the applicant's trade name or mark and the type designation. The manufacturer shall make provision for the subsequent compulsory display of the EC type-approval mark. 1. If the relevant requirements are met, the approval authority shall grant EC type-approval and issue a type-approval number in accordance with the numbering system set out in Annex VII to Directive 2007/46/EC. ‘X’ if the frontal protection system complies with Section 5 of Annex I with respect to the application of points 5.1.1.3, 5.1.2.2, 5.2 and 5.3 thereof. 3. An approval authority shall not assign the same number to another type of vehicle or type of frontal protection system. the model set out in Part 3 of Annex III for a type of a frontal protection system to be supplied as a separate technical unit. Every frontal protection system approved in accordance with this Regulation under the type-approval of a vehicle with regard to it being fitted with a frontal protection system, or the type-approval of a frontal protection system to be supplied as a separate technical unit, shall comply with the requirements of this Regulation and shall be granted, and consequently bear, an EC type-approval mark established in accordance with the provisions set out in Annex IV. Any modification of the vehicle forward of the A-pillars or of the frontal protection system which affects either the structure, the main dimensions, the materials of the outer surfaces of the vehicle, the fixing methods or the external or internal component arrangement, and which may have a significant influence on the results of the tests, shall be regarded as an amendment pursuant to Article 13 of Directive 2007/46/EC and thus require a new application for type-approval. category N1 derived from M1 and of maximum mass not exceeding 2 500 kg which do not comply with the technical provisions set out in Sections 2 and 4 or Sections 3 and 4 of Annex I.
vehicles of category N1 derived from M1 and of maximum mass not exceeding 2 500 kg. category N1 derived from M1 and of maximum mass not exceeding 2 500 kg which do not comply with the technical provisions set out in Section 3 of Annex I.
vehicles of category N1 derived from M1, and of maximum mass not exceeding 2 500 kg. category N1 which do not comply with the technical provisions set out in Sections 3 and 4 of Annex I. 6. With effect from 24 August 2015, national authorities shall, on grounds relating to pedestrian protection, consider the certificates of conformity to be no longer valid for the purposes of Article 26 of Directive 2007/46/EC, and shall prohibit the registration, sale and entry into service of new category N1 vehicles which do not comply with the technical provisions set out in Section 4 of Annex I to this Regulation. category N1 derived from M1, and of maximum mass not exceeding 2 500 kg, which do not comply with the technical provisions set out in Section 3 of Annex I to this Regulation. category N1 which do not comply with the technical provisions set out in Section 3 of Annex I to this Regulation. 9. Without prejudice to paragraphs 1 to 8 of this Article and subject to the entry into force of the measures adopted pursuant to Article 4(6), if a manufacturer so requests, the national authorities shall not, on grounds relating to pedestrian protection, refuse to grant EC type-approval or national type-approval for a new type of vehicle or prohibit the registration, sale or entry into service of a new vehicle, where the vehicle concerned complies with the technical provisions set out in Sections 3 or 4 of Annex I. 1. National authorities shall refuse to grant EC type-approval or national type-approval of a new type of vehicle with regard to it being fitted with a frontal protection system, or EC separate technical unit type-approval of a new type of frontal protection system, which does not comply with the requirements laid down in Sections 5 and 6 of Annex I. 2. National authorities shall, on grounds relating to frontal protection systems, consider the certificates of conformity to be no longer valid for the purposes of Article 26 of Directive 2007/46/EC and shall prohibit the registration, sale and entry into service of new vehicles which do not comply with the requirements laid down in Sections 5 and 6 of Annex I to this Regulation. 3. The requirements set out in Sections 5 and 6 of Annex I to this Regulation shall apply to frontal protection systems supplied as separate technical units for the purposes of Article 28 of Directive 2007/46/EC. 1. Upon assessment by the Commission, vehicles equipped with collision avoidance systems may not have to fulfil the test requirements laid down in Sections 2 and 3 of Annex I in order to be granted an EC type-approval or a national type-approval for a type of a vehicle with regard to pedestrian protection, or to be sold, registered or to enter into service. 2. The Commission shall present the assessment to the European Parliament and to the Council, accompanied by proposals amending this Regulation if appropriate. Any measures proposed shall ensure levels of protection which are at least equivalent, in terms of actual effectiveness, to those provided by Sections 2 and 3 of Annex I. 1. The national authorities shall provide the Commission with the results of the monitoring referred to in points 2.2, 2.4 and 3.2 of Annex I on a yearly basis and at the latest by 28 February of the year following that of their acquisition. The requirement to provide those results shall cease to apply from 24 February 2014. 2. The Commission may, on the basis of the results of the monitoring completed under points 2.2, 2.4 and 3.2 of Annex I, adopt implementing measures as appropriate. Those measures, designed to amend non-essential elements of this Regulation, inter alia, by supplementing it, shall be adopted in accordance with the regulatory procedure with scrutiny referred to in Article 40(2) of Directive 2007/46/EC. 3. The Commission, acting on the basis of relevant information communicated by the approval authorities and interested parties as well as on the basis of independent studies, shall monitor the technical developments in the field of enhanced passive safety requirements, brake assist and other active safety technologies which may provide improved protection to vulnerable road users. 4. By 24 February 2014, the Commission shall review the feasibility and application of any such enhanced passive safety requirements. It shall review the functioning of this Regulation with regard to the use and effectiveness of brake assist and other active safety technologies. 5. The Commission shall submit a report to the European Parliament and the Council, accompanied by proposals on the subject as appropriate. 1. Member States shall lay down the provisions on penalties applicable for infringement by manufacturers of the provisions of this Regulation and shall take all measures necessary to ensure that they are implemented. The penalties provided for shall be effective, proportionate and dissuasive. Member States shall notify those provisions to the Commission by 24 August 2010 and shall notify it without delay of any subsequent amendment affecting them. Directive 2007/46/EC shall be amended in accordance with Annex V to this Regulation. Directives 2003/102/EC and 2005/66/EC shall be repealed with effect from the date set out in the second paragraph of Article 16 of this Regulation. References to the repealed Directives shall be construed as references to this Regulation. It shall apply from 24 November 2009 with the exception of Article 4(6) and Article 9(9) which shall apply from the day of entry into force and Article 9(2) to (8) which shall apply from the dates set therein. (1) OJ C 211, 19.8.2008, p. 9. (2) Opinion of the European Parliament of 18 June 2008 (not yet published in the Official Journal) and Council Decision of 16 December 2008. (4) OJ L 321, 6.12.2003, p. 15. (5) OJ L 309, 25.11.2005, p. 37. 1.10. ‘radius of curvature’ means the radius of the arc of a circle which comes closest to the rounded form of the component under consideration. the test is performed at an impact speed of 40 km/h. The instantaneous sum of the impact forces with respect to time shall not exceed 7,5 kN and the bending moment on the test impactor shall not exceed 510 Nm. The test is performed at an impact speed up to 40 km/h. The instantaneous sum of the impact forces with respect to time should not exceed a possible target of 5,0 kN and the bending moment on the test impactor shall be recorded and compared with the possible target of 300 Nm. This test shall be completed for monitoring purposes only and the results shall be fully recorded. The test is performed at an impact speed of 35 km/h using a 3,5 kg test impactor. The HPC shall not exceed 1 000 over 2/3 of the bonnet test area and 2 000 for the remaining 1/3 of the bonnet test area. The test is performed at an impact speed of 35 km/h using a 4,8 kg test impactor. The HPC shall be recorded and compared with the possible target of 1 000.
the test is performed at an impact speed of 40 km/h. The maximum dynamic knee bending angle shall not exceed 19,0 °, the maximum dynamic knee shearing displacement shall not exceed 6,0 mm, and the acceleration measured at the upper end of the tibia shall not exceed 170 g.
The test is performed at an impact speed up to 40 km/h. The instantaneous sum of the impact forces with respect to time shall be compared with a possible maximum of 5,0 kN and the bending moment on the test impactor shall be compared with a possible maximum of 300 Nm. The test is performed at an impact speed of 35 km/h using a 3,5 kg test impactor. The HPC shall comply with the requirements of point 3.5. The test performed at an impact speed of 35 km/h using a 4,5 kg test impactor. The HPC shall comply with the requirements of point 3.5. 3.5. The HPC recorded shall not exceed 1 000 over one half of the child headform test area and, in addition, shall not exceed 1 000 over 2/3 of the combined child and adult headform test areas. The HPC for the remaining areas shall not exceed 1 700 for both headforms. 4.1. A reference test to identify the system operation point at which the anti-lock braking system (ABS) activates. 4.2. A test to verify that the operation of the brake assist system is correctly triggered so as to apply the maximum achievable deceleration characteristics of the vehicle. All the tests shall be performed at an impact speed of 40 km/h. 5.1.1.1. For an FPS approved for fitting to vehicles that comply with the requirements of Section 2 the maximum dynamic knee bending angle shall not exceed 21,0 °, the maximum dynamic knee shearing displacement shall not exceed 6,0 mm, and the acceleration measured at the upper end of the tibia shall not exceed 200 g.
5.1.1.2. For an FPS approved for fitting to vehicles that comply with the requirements of Section 3 the maximum dynamic knee bending angle shall not exceed 19,0 °, the maximum dynamic knee shearing displacement shall not exceed 6,0 mm, and the acceleration measured at the upper end of the tibia shall not exceed 170 g.
For an FPS approved for fitting only to vehicles which do not comply with either Section 2 or Section 3 the test requirements set out in points 5.1.1.1 and 5.1.1.2 may be replaced by the test requirements set out in either point 5.1.1.3.1 or point 5.1.1.3.2. 5.1.1.3.1. The maximum dynamic knee bending angle shall not exceed 24,0 °, the maximum dynamic knee shearing displacement shall not exceed 7,5 mm, and the acceleration measured at the upper end of the tibia shall not exceed 215 g.
5.1.1.3.2. A pair of tests shall be performed on the vehicle, one with the FPS fitted, and a second without the FPS fitted. Each pair of tests shall be performed in equivalent locations as agreed with the relevant approval authority. The values for the maximum dynamic knee bending angle, the maximum dynamic knee shearing displacement and the acceleration measured at the upper end of the tibia shall be recorded. In each case the value recorded for the vehicle fitted with the FPS shall not exceed 90 % of the value recorded for the vehicle without the FPS fitted. 5.1.2.1. The instantaneous sum of the impact forces with respect to time shall not exceed 7,5 kN and the bending moment on the test impactor shall not exceed 510 Nm. For an FPS approved for fitting only to vehicles which do not comply with either Section 2 or Section 3, the test requirements set out in point 5.1.2.1 may be replaced by the test requirements set out in either point 5.1.2.2.1 or point 5.1.2.2.2. 5.1.2.2.1. The instantaneous sum of the impact forces with respect to time shall not exceed 9,4 kN and the bending moment on the test impactor shall not exceed 640 Nm. 5.1.2.2.2. A pair of tests shall be performed on the vehicle, one with the FPS fitted, and a second without the FPS fitted. Each pair of tests shall be performed in equivalent locations as agreed with the relevant approval authority. The values for the instantaneous sum of the impact forces and the bending moment on the test impactor shall be recorded. In each case the value recorded for the vehicle fitted with the FPS shall not exceed 90 % of the value recorded for the vehicle without the FPS fitted. The test is performed at an impact speed 40 km/h. The instantaneous sum of the impact forces with respect to time, to the top and the bottom of the impactor, should not exceed a possible target of 5,0 kN and the bending moment on the test impactor should not exceed a possible target of 300 Nm. Both results shall be recorded for monitoring purposes. The test is performed at an impact speed of 35 km/h using a 3,5 kg headform test impactor for the child/small adult. The HPC calculated from the resultant of the accelerometer time histories shall not exceed 1 000 in all cases. The following requirements apply equally to FPS fitted to new vehicles and to FPS to be supplied as separate technical units for fitting to specified vehicles. 6.1.1. The components of the FPS shall be so designed that all rigid surfaces which can be contacted by a 100 mm sphere, have a minimum radius of curvature of 5 mm. 6.1.2. The total mass of the FPS, including all brackets and fixings, shall not exceed 1,2 % of the maximum mass of the vehicle for which it is designed, subject to a maximum of 18 kg. 6.1.3. The height of the FPS, when fitted to a vehicle, shall be no more than 50 mm above the height of the bonnet leading edge reference line. 6.1.4. The FPS shall not increase the width of the vehicle to which it is fitted. If the overall width of the FPS is more than 75 % of the width of the vehicle, the ends of the FPS shall be turned in towards the external surface in order to minimise the risk of fouling. This requirement is considered to be satisfied if either the FPS is recessed or integrated within the bodywork or the end of the FPS is turned so that it is not contactable by a 100 mm sphere and the gap between the end of the FPS and the surrounding bodywork does not exceed 20 mm. 6.1.5. Subject to point 6.1.4, the gap between the components of the FPS and the underlying external surface shall not exceed 80 mm. Local discontinuities in the general contour of the underlying body (such as apertures in grilles, air intakes, etc.) shall be ignored. 6.1.6. At any lateral position across the vehicle, in order to preserve the benefits of the vehicle bumper, the longitudinal distance between the most forward part of the bumper and the most forward part of the FPS shall not exceed 50 mm. 6.1.7. The FPS shall not reduce significantly the effectiveness of the bumper. This requirement shall be considered to be satisfied if there are no more than two vertical components and no horizontal components of the FPS overlapping the bumper. 6.1.8. The FPS shall not be inclined forward of the vertical. The top parts of the FPS shall not extend upwards or rearwards (towards the windscreen) more than 50 mm from the bonnet leading edge reference line of the vehicle with the FPS removed. 6.1.9. Conformity with the requirements of the vehicle type-approval shall not be compromised by the fitting of a FPS. 7. By derogation to Sections 2, 3 and 5, the relevant approval authority may consider the requirements for any of the tests laid down therein to be fulfilled by any equivalent testing carried out under the requirements of another test pursuant to this Annex. (1) OJ L 267, 19.10.1977, p. 1. 9.23.1. A detailed description, including photographs and/or drawings, of the vehicle with respect to the structure, the dimensions, the relevant reference lines and the constituent materials of the frontal part of the vehicle (interior and exterior) shall be provided. This description shall include detail of any active protection system installed. If the systems, components or separate technical units make use of specialist materials, information concerning their performance shall be supplied. (2) Delete where not applicable (there are cases where nothing needs to be deleted when more than one entry is applicable). (3) Classified according to the definitions listed in Section A of Annex II to Directive 2007/46/EC of the European Parliament and of the Council of 5 September 2007 establishing a framework for the approval of motor vehicles and their trailers, and of systems, components and separate technical units intended for such vehicles (Framework Directive) (OJ L 263, 9.10.2007, p. 1). Details of brake assist system supplied (12). (2) Insert number of amending Regulation. (3) If the means of identification of type contains characters not relevant to describe the vehicle, component or separate technical unit types covered by this information, such characters shall be represented in the documentation by the symbol ‘?’ (e.g. ABC??123??). (4) As defined in Section A of Annex II to Directive 2007/46/EC of the European Parliament and of the Council of 5 September 2007 establishing a framework for the approval of motor vehicles and their trailers, and of systems, components and separate technical units intended for such vehicles (Framework Directive) (OJ L 263, 9.10.2007, p. 1). (6) According to the values specified in Section 2 of Annex I to Regulation (EC) No 78/2009. (7) For monitoring purposes only. (8) According to Commission [implementing legislation]. (9) According to the values specified in Section 3 of Annex I to Regulation (EC) No 78/2009. (10) For monitoring purposes only. (11) According to Commission [implementing legislation]. (12) Provide details of system operation method. (13) Provide details of testing completed to verify system. 1.2. In the vicinity of the rectangle the ‘base approval number’ contained in Section 4 of the type-approval number referred to in Annex VII to Directive 2007/46/EC, preceded by the two figures indicating the sequence number assigned to the latest major technical amendment to this Regulation on the date the EC type-approval was granted. The sequence number for this Regulation is 02. 1.3.3. ‘X’ to indicate that the frontal protection system was approved under the consideration, for the legform impactor test, allowed by points 5.1.1.3 or 5.1.2.2 of Annex I and is only suitable for fitting to vehicles that do not comply with either Section 2 or Section 3 of Annex I. 1.4. The EC type-approval mark shall be clearly legible, indelible and clearly visible when installed on the vehicle. 1.5. An example of the approval mark is given in the Appendix to this Annex. 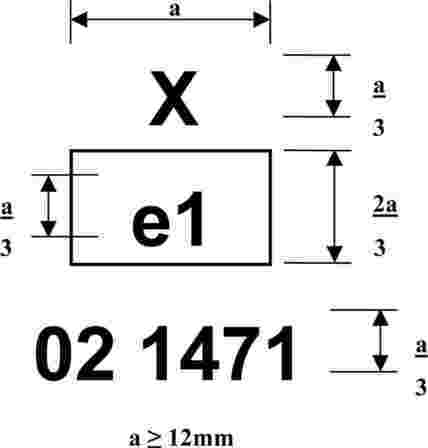 The device bearing the EC type-approval mark shown above is for a frontal protection system type-approved in Germany (e1) pursuant to this Regulation (02) under the base approval number 1471. The letter ‘X’ indicates that the frontal protection system was approved under the consideration, for the legform impactor test, allowed by either point 5.1.1.3 or 5.1.2.2 of Annex I. Item 60 shall be deleted.